Two days off-campus training was conducted by ICAR-CIFRI at Mansadwip, Sagar Island under Tribal Sub Plan from 26 th March to 27 th March, 2018. 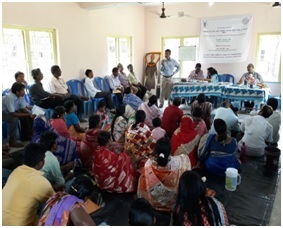 About, 100 fishers/fish farmers including fisherwomen participated in the programme. The off- campus training was conducted in collaboration with Vivekanda Youth and Cultural Society, Sagar. 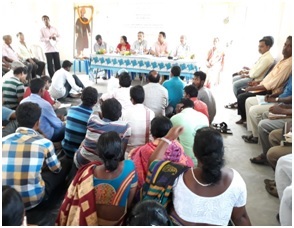 On 1 st day, an open house discussion was arranged to identify the needs of the fishers. Based on their need major focus was given on utilization of derelict water bodies for fish production. The fishers/fish farmers were trained on various aspects of inland fisheries management including feeding, disease management etc. A practical session on assessing water quality was also arranged. The off-campus training programme was coordinated by Dr. M.A. Hassan, Principal Scientsit; Dr. Aparna Roy, Scientist; Dr. Pronob Gogoi, Scientist and Mr. Suvendu Mandal, Senior Technical Assistant.